The Horrors of Randomness in Xenoblade 2 – What's in a Game? 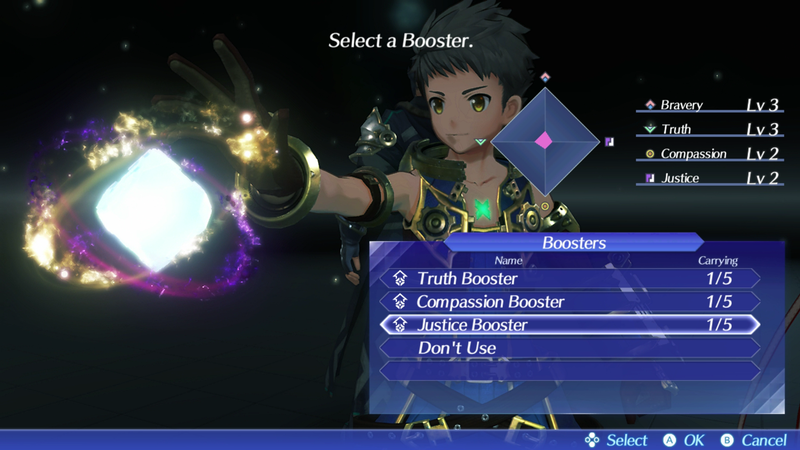 The root of most of Xenoblade 2’s progression system is in receiving blades, fighters you can attach to your characters that determine the weapons and class of your characters. To obtain most blades, you must participate in a gacha-like system. You obtain cores as drops from enemies, which when paired with a character of your choice, will turn into a random blade. In the game, it’s unclear how random this is and what affects it. Optional story scenes for rare blades, only if you happen to collect them. Fortunately, Overdrive Protocols allow you to change which characters blades are paired with, allowing players to give blades they got on one character to another. Unfortunately, I only found three in sixty hours of gameplay. To make matters worse, I wasted two because I didn’t know how rare they were. This is one instance where the game could’ve taught me better. Why would someone consider the randomness great? Randomness forces you to work within restrictions. A large reason randomness is in games is to introduce variety. This variety is limited – you’re only going to get certain blades in your playthrough and you must deal with what you get. These restrictions encourage players to play better and learn more mechanics. Some players like working with these restrictions. Rolling the dice and seeing what you’re going to get can be fun. Couldn’t the game force players to work within restrictions another way? Perhaps put the player in situations when they would want to change Blades to use different weapons or elements. Randomness forces future playthroughs to be different. In future playthroughs, you’re unlikely to get the same blades as last time increasing variation in playthroughs automatically. Is this a good thing? Some players don’t want the game to be different. Why not let the players control how different it is? Aren’t there other ways to encourage the gameplay to be different on a second playthrough without forcing it? Certainly, players that want variety can have it anyway with as many options as there are in the game. If you’re striving for variety, you shouldn’t think so much about multiple playthrough variety in a 60-100 hour game that it hinders the first experience. Most people will only play this once. Some could say the game needed more variety in the first playthrough instead. It’s fun seeing if I’ll get a Rare Blade! This could be true. I would still suggest that there’s a defined way to get the rare blade anyway. It influences too many aspects of the strategy in battle. Player luck will determine how they feel about the game, taking control away from the game designer. There is a possibility that someone will be unlucky enough to get stuck with blades that are not useful together, while other players can get very lucky. This widens the range of low to high skill player types. I’m not sure how they balanced the game, but I imagine it would be hard to balance for these unlucky or very lucky players. It can block (and has blocked) people in the main story. Additionally, let’s consider why they added a field skill blocker in the main story. I would imagine they were thinking this is a heuristic of how good the player is at this point in the game, as a good blocker in the story would be. This would allow the game designers to have a minimum bar for boss difficulty. Unfortunately, due to the random nature of blade acquisition, field skills are not a heuristic of minimum skill a player must have as you could get lucky and have just the blades you need. Gives developers a reason to only include one save file. Ridiculous. They go through this long partially-unskippable animation. 30 seconds * 100 = 1 hour. This should be a quick thing. Value your players’ time. Allow the player to choose which character a Blade gets assigned to once you know or make it easier to switch characters. This is a must. It’s already overly restrictive. There’s nothing worse than getting the right blade for the wrong character. Remove the randomness completely? This would be extremely complicated and change the nature of the game entirely, so I wouldn’t recommend this. Have a guaranteed way to get Rare Blades? This would be a good thing. I would suggest a type of core that guarantees you a rare Blade that you can get from completing certain side quests. This way, at least the player has a way of getting rare blades they want. Reduce the number of mechanics that rely on the randomness? This would allow the same amount of randomization and the fun of collecting different rare blades while allowing players to progress in a way that the game designers can control. Perhaps if field skills could be learned by any blade using an item. Maybe if you could change the element of a blade with an item? Don’t use real randomness? One possibility is to use faux-random number generation. Imagine that you have a 1/10 chance, but you are guaranteed that if the first 9 aren’t great, then the 10th would be great. This would be virtually invisible to players, but allow the game designers a chance to balance things a bit better and mitigate the potential of someone getting super unlucky.